Defending Australian Production Car Champion Beric Lynton and co-driver Tim Leahey will make their return to the series today at Queensland Raceway after work commitments forced them to miss rounds two and three. 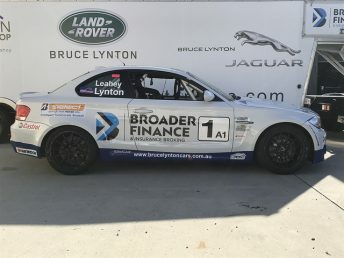 Round four of the APC will be held at the Ipswich venue across August 4-6, with Lynton and Leahey to contest the #1 Bruce Lynton Prestige Automotive BMW1M in the A1 Class. “The car has been prepared for this round – although it hasn’t been driven since the Bathurst 6 hour and Tim and I also haven’t driven since then,” Lynton said. “We will turn up this weekend to race hard. We are not in championship contention, so we don’t need to worry about banking points. “A strong field has entered with the addition of some local M3s that’ll perform well on the long straights, and we are looking forward to the challenge. “We won the round there last year, so we are keen to come back and defend the QR round, while for the first time, running the number one on the car since taking out the title year. “While we have won the championship before, in that case I stuck with my normal number – this time, we have changed to the number one to highlight the successful history of the car as it is up for sale. Next Story Unknown awaits Elliott at Thruxton BSB Previous Story FullGas Racing Fully Armed for "Fight in the Night"